This is nice holiday set consists of three pretty interior cushion prepared especially for Christmas and New Year. Author choose following cute samples for decorate them: Adorable kitten embroidery design, Gingerbread trio embroidery design and Christmas teddy with toy deer machine embroidery design. They are executed in different style but together they look like natural elements of one well elaborated composition. This is pretty embroidered textile bag which is prepared as pack for Christmas gift. This unique and memorable thing can make any littlest gift very memorable. By way it is not difficult to repeat this idea: you just need to take suitable printed fabric with symbols of holiday and add it by Merry Christmas free embroidery design 3. That is all! This is nice embroidered napkin prepared as Christmas gift by RuthAnn Gianneschi. It has very well elaborated and beautiful design based on three samples at same time. From left to right they are Christmas mouse embroidery design, Mouse on fir tree embroidery design and Mouse swinging on Christmas toy embroidery design. These pictures are executed at same style so they create beautiful composition. This is nice holiday composition which definitely reminds that Christmas is coming. There are wooden horse, gnome with fluffy beard and embroidered cushion at it. Pretty interior pillow is decorated with Small Christmas bird with hat embroidery design. This is interesting sample which doesn’t use ordinary attributes of well-known festival. But you can recognize famous Santa’s cap on bird’ head. This photo shows nice Christmas composition which creates merry holiday mood. Here you can see beautiful candlestick looking like metal lace and amazing case which seems to be pretty holiday gift for somebody. It is decorated with Redwork Christmas ball free machine embroidery design 2. This thematic sample is very good for making cool leather case which is suitable for keeping glasses or phone. This pretty embroidered napkin which is able to embellish any holiday meal. Its bright design is based on traditional ornament with floral motives. But it is not just cute bouquet: it is… stylized Christmas tree! So you may use Flowers Christmas tree free embroidery design to create good decoration for your own home or make gifts for your beloved friends. There are two pretty embroidered souvenir made in Christmas style. Both of them are textile cones embellished by original embroidery scheme. One in foreground is Santa Claus cross stitch free embroidery design. These original work pieces can be good gift for Christmas and New Year holidays for your friends or beloved relatives. You also can use it yourself as toys for Christmas tree or decoration serving. This is amazing case for smartphone or glasses executed by Johanna Hasselbrink‎. It s made from thin leather with delicate shine. This one is definitely prepared as well elaborated gift for Christmas and New Year holiday. It is clear because of usage pretty Modern Christmas tree free embroidery design 9. This picture is stylized silhouette of well-known Christmas tree with snowflakes embellishing it. This is pretty textile bag with original embroidery sample on front side. 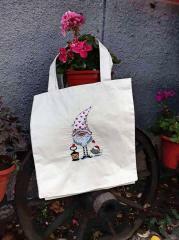 You can use it as independent accessory or take it to pack gifts for your friend or relative. Gnome in phrygian cap with hearts holding lantern embroidery design is original sample which let you apply this work piece both for Christmas and Valentine’s day holiday. Just look how pretty it looks together with beautiful flowers. You also can change it for branch of Christmas tree. This is laconic and stylish embroidered kitchen accessory. Originally it is potholder, but it also can be used as napkin or other thing. Its top side is decorated with Modern Christmas Tree free machine embroidery design. Anna Bienek, author of this work piece, chose it because it is gift for her friend for Christmas. You also can create such pretty handmade gift. This is fragment of textile work piece prepared for Christmas and New Year holidays. It is embellished by Snowmen meet machine embroidery design. This picture shows two merry snowmen which are ready to decorated fluffy Christmas tree. They are keeping some toys in their hands and wearing warm scarves. One of them has traditional holiday cap on its head. 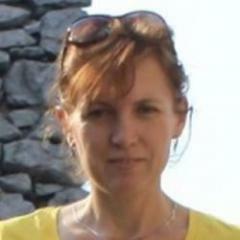 ekatreina posted a gallery image in Now in work. This light and bright picture let us examine figure of favorite cartoon character in all smallest details. 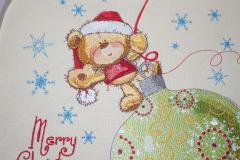 It is based on Teddy bear on Christmas ball embroidery design. It shows little Teddy which is ready to meet Christmas. It is standing on Christmas toy in traditional holiday cap and in some minutes it will start to decorate Christmas tree with its friends. Adorable hand made gift for your family and friends. This picture is fragment of work piece which is now in work preparing for Christmas holiday. There is Teddy bear on Christmas ball embroidery design added by many fluffy snowflakes which creates true atmosphere of merry winter festival. Original manner of picture let us carefully examine many little details of sample such as direction of stitches and shades of threads used for it. On this picture we see almost ready Christmas gift made by author on base of Teddy bear on Christmas ball embroidery design. This picture shows figure of beloved cartoon hero on beautiful Christmas toy. It is ready to start to decorate Christmas tree. Embroidery sample is added by warm wishes and many fluffy snowflakes around little merry bear in traditional cap. 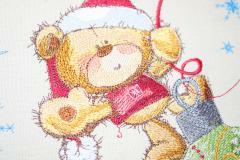 This picture shows close up plan of work piece decorated by Teddy bear on Christmas ball embroidery design. It let us carefully examine main character of this sample: it is funny little Teddy which is already dressed in traditional bright cap with fluffy pompon. It is ready to celebrate favorite holiday and decorate Christmas tree. Teddy waving us by its paw inviting to join! This picture let you estimate intermediate stage of making embroidered Christmas gift. 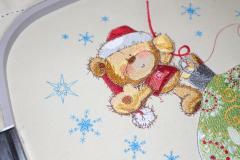 Ready work piece will be decorated by Teddy bear on Christmas ball embroidery design. Now it is done for half: you can see figure or Teddy but Christmas ball where it stands is not ready yet. Author also finished some pretty snowflakes which surround our cute cartoon character. 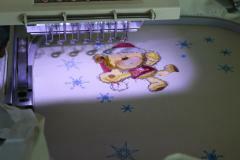 This picture shows how author works on Teddy bear on Christmas ball embroidery design. This sample is able to be nice picture for decorating handmade Christmas gift. 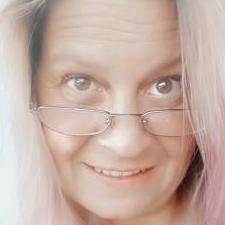 Figure of pretty little bear is just part of whole image. It will be added by beautiful holiday Christmas ball for fluffy green tree. For more festive atmosphere author embroidered fluffy snowflakes everywhere around Teddy. This picture shows simple and effective way to create pretty Christmas gift by your own hands. All that you need is just little cushion of suitable printed fabric, our Christmas Lantern free machine embroidery design and some patience. Then you execute this sample on front part of pillow and – voila! – you made original and unique souvenir which will definitely please your friend or relative. Christmas is the favorite celebration of children all over the world, and little bears are not exclusion. 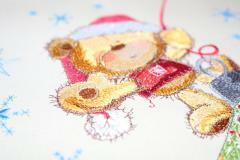 This small bear is already decorating the Bear decorating New Year tree machine embroidery design. This Bear decorating New Year tree machine embroidery design is made in cartoon manner. The texture of the stitches is very good for this picture: the bear and green Christmas tree look fluffy and a little shaggy due to it. There is the final stage of work on the embroidered picture of two little bears which are preparing for Christmas: they already bought the gifts for their friends and now they are choosing the toys for the tree. This Bear decorating New Year tree machine embroidery design is quite difficult and requires much work but it is definitely the excellent image for decoration of any textile accessories for New Year and Christmas. This picture shows two little bears waiting for New Year: they seem to be brothers who already prepared fluffy Christmas tree and some gifts under it. The older bear wears the costume of Santa Claus and the younger one is in green sweater with red bow. Bear decorating New Year tree machine embroidery design is the very good picture for decoration of textile for children for New Year and Christmas celebration. This picture is the fragment of whole image devoted to New Year and Christmas celebration: here we used Bear decorating New Year tree machine embroidery design. There is the funny cartoon bear in the traditional red costume of Santa Claus who is finishing the process of decoration. He keeps bright golden star in his paws and now he is ready to hang it to the top of fluffy Christmas tree. 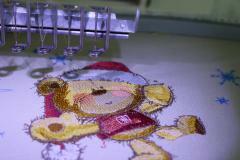 There is the picture which shows the process of work on Bear decorating New Year tree machine embroidery design. On the foreground you see the figure of funny cartoon bear in red Santa Claus’ costume which is already completely finished. The Christmas tree itself is also accomplished. But on the background there is the figure of second bear which has to be completed: now it includes just some parts of this image. This picture demonstrates the height of the work on Bear decorating New Year tree machine embroidery design. It is quite difficult embroidery sample which requires the threads of many colors and the presence of certain skills in machine embroidery. Now the half of the picture is completed: one small bear and Christmas tree itself are already done. But the right part of the sample is still has to be finished. There is the pretty set of three embroidered Christmas souvenirs made from light knitted fabric of snowy white shade. Each of these work pieces are embellished with the suitable silk band and embroidery sample. For example the right one is decorated with Christmas bell free embroidery design while the item in the middle uses Christmas tree machine embroidery design. The intensive colors chose for these souvenirs look even more brightly at the white background.